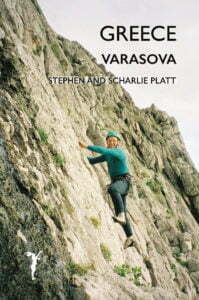 In 2003 we went climbing with Muni and Rose to Varasova, a limestone cliff in Greece east of Missolonghi. This 900m high promontory that drops into the Ionian Sea is the home of Greek climbing. There are over 200 routes, some sports routes of 3-4 pitches on the south face near the sea and some much longer trad climbs of up to 18 pitches on the south-west face. The rock is very solid, relatively sharp, mostly gray or yellow limestone of outstanding quality. We climbed a lot of routes at VS standard with a couple of longer more serious climbs. Scharlie also had an adventure climbing the mountain to the summit on her own one day. 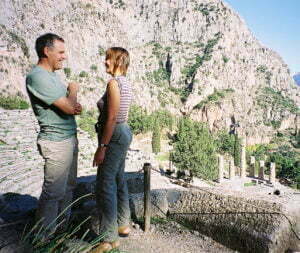 We visited Missolonghi where Byron had died of a fever fighting for Greek independence, and Nafpaktos where Cervantes had lost an arm fi ghting in the sea battle of Lepanto in the Gulf of Corinth, We also went to Delphi where Rose and Scharlie had a race around the 400 m stadium.